- relaxing: The house sits right on the shore of the Sound of Sleat so is the perfect place to sit and enjoy the ever-changing views, either out on the deck watching the birds and enjoying the stillness of the bay or inside savouring the warmth of the wood-burning stove, reading or painting and maybe listening to music. - walking and swimming: The bay and nearby beaches are perfect for gentle walks and in warmer weather the swimming is wonderful. - bird-watching: the bay has plenty of oyster catchers, herons and other sea birds which you can watch from the house. Further afield you can see buzzards, Golden Eagles, and if you're lucky Sea Eagles. - sea kayaking: the bay is totally sheltered which is ideal for kayaking, whether as a beginner or more experienced sea kayaker. Tuition is available locally from Skyak Adventures (see links). - nature spotting: if you are very lucky you might see an otter in the bay, otherwise try the Rubha Phoil Forest trail near Armadale or visit the Bright Water Visitor Centre in Kyleakin, where you can learn more about the life of Gavin Maxwell, the naturalist and author of Ring of Bright Water. Porpoises can occasionally be spotted in the Sound if you use binoculars or you can take a boat trip from nearby Armadale or further away at Kyle, Plockton or Elgol for seal and whale watching: between mid-June and the end of September is your best chance to see seals, porpoise, humpbacks, minkes, basking sharks, bottlenose dolphins and even killer whales. - sightseeing. 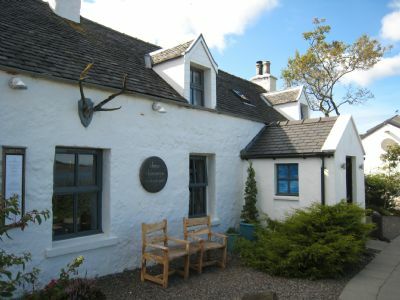 The history and culture of Skye can be experienced in numerous places, including the Clan Donald Centre in nearby Armadale which has a small museum and comprehensive library, the Sabhal Mor Ostaig, Scotland's Gaelic college which is 10 minutes drive to the South or one of Skye's many museums, including the Museum of Island Life which has seven thatched cottages, recreating life on the island as it was in former times. Interesting castles to visit include Dunvegan, seat of the MacLeods for nearly 800 years, which is the oldest inhabited castle in the UK and is open to visitors all year round, Eilean Donan, just south of Kyle and numerous ruined castles, including the picturesque Dunsgaith Castle 20 minutes away in Tokavaig. - enjoying the food and drink. Our local bar and restaurant at the Eilean Donan hotel in Isle Ornsay is a mere 10 minutes walk away or the cafe and shop at An Crubh are only 4 minutes drive. 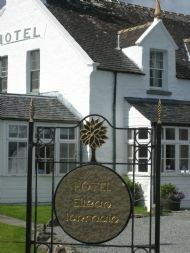 For the true gourmet try Clare MacDonald's restaurant at Kinloch Loch, just 10 minutes drive away. The famous Three Chimneys restaurant is a long drive but worth the trip for its stunning food. Or jump on a boat to the Old Forge at Inverie on Knoydart, the remotest pub on the British mainland, which serves fantastic fresh food at reasonable prices. Talisker is the island's only single malt distillery. For beer drinkers, there's the award winning range from the Isle of Skye Brewing Company, including Red and Black Cuillin and Blaven. - Shopping. Skye has a wealth of interesting things to buy, especially arts and crafts, including wood engravings from the Raven Press gallery in Colbost, stunning photographs from the Three Herons Studio on Broadford, knitwear from the famous Ragamuffin in Armadale and fantastic soaps from Skye Soaps in Portree. It's a long drive, past Dunvegan, but the food is worth it!